The Summit Project is a Living Memorial supported by an ever growing family of thousands of dedicated and patriotic individuals who all have personally invested in our mission. We are a nationally recognized, Maine based, 501(c)3 service organization and we have a very special way of paying tribute to the fallen service members from Maine who have died in the line of duty since September 11, 2001. We ensure that Maine Heroes are NOT Forgotten by carrying their memorial stones on tribute hikes and carrying their stories for a lifetime. Our mission: to honor our state’s newest war casualties and the faithful spirit of all Mainers. 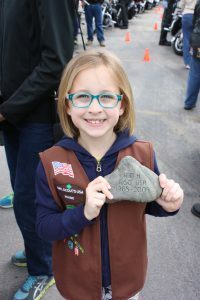 If you would like to take part in our program by carrying a hero's stone, you can check for availability and complete our application. Over Memorial Day Weekend, 48 hikers will climb various summits in Baxter State Park as part of The Summit Project’s first of two annual signature events. The Summit Project is a Living Memorial and ensures that Maine Heroes are NOT Forgotten. All the proceeds raised via TSP Store go to stock replenishment and operational costs of the program.